The essential spiritual message is always the same, that everything in the Universe is an intrinsic part of an ordered greater whole. Astrology is such a beautiful way of reflecting this message. The Zodiac represents the totality of life. Individual beings emerge from this totality to identify with the partial astrological conditions of the moment of their birth. In time they die, and submerge their separate birth chart into the Zodiac once again. The only problem with this is for the individual beings themselves who forget their part in the greater scheme of things and identify with their own separateness. In doing so they lose awareness of the role they have to play in life and its relationship to everything around them. This causes them to suffer. This suffering brings about the need for spiritual teachers, individual beings who through their own experience have gained enough insight into their connection with the greater whole to be able to show it to others. Whilst the spiritual message is ultimately always the same, the people that need reminding of it are stuck in the partial astrological conditions of the time, so any teacher seeking to help them would need to be able to strongly relate the message to those conditions. This is the reason why so many people reject the spiritual guidance of the institutions that shaped their parents generation. It is not that the essential message is wrong, it is just being communicated through an astrological filter that is not relevant to the time. The problem with this is that the very recipients who are in greatest need of the message do not identify with the underlying, unchanging nature. They are, whether they know it or not, bound by the astrology of their time and cannot receive any message that is not communicated through it. The astrological patterns of generations tend to be set by the movements and relationships of the outer planets of the solar system, particularly Uranus, Neptune and Pluto. This is because these patterns remain in place for a number of years. The generation born between 1952 and 58 had the Uranus / Neptune square aspect. Their formative years would be somewhere between 1967 and 76. The cultural revolution of the Uranus / Pluto conjunction in the mid 1960s had already taken place so these teenagers are certainly not going to be persuaded by the organised religion of Jupiter and Saturn. This would be seen as repressive and irrelevant. Uranus and Neptune is about experimentation and the dissolving of boundaries set by Saturn. The square aspect between these two accounted for incredible changes in so many areas of life but particularly shows the enormous increase in recreational drug taking that occurred once this group of people got into their teens. Anyone looking to pass on a spiritual message to this generation would have to be prepared to take a quantum jump in terms of the presentation of such a message. It is said that we all choose our own incarnations. This may be true but its unlikely that many of them are chosen consciously and deliberately. It is perhaps the mark of a great teacher that they choose to be born at a particular time and their appearance is chosen to convey the message to people of that time. It therefore makes sense that people born outside of that time will not understand the message or even see it at all. Not many people would recognise Daevid Allen as a spiritual teacher. Most of the obituaries say that the founder member of Soft Machine and Gong was a poet, singer, guitarist and composer and all round eccentric. An anti establishment hippie whose own experiments with psychedelic drugs left him floating in an anarchic and imaginary world of pixies and teapots. His obituary in the Daily Telegraph ( in itself a bizarre notion ) suggested ” Allen never achieved – or sought – pop stardom. Instead, he stayed true to the hippie dream of musical freedom and hallucinogenic hedonism ” and ” his mixture of Aussie blokeishness and eccentric, “spaced-out” ramblings established him as one of the most colourful characters in early-1970s rock music “. Gong were described as ” hippie jokers who mixed adult fairy tales with an adventurous rock sound “. But this sound was laid on top of a fundamental principle that has been used throughout history in sacred music. Gurdjieff described such music as objective art, where the artist deliberately chooses a form designed to lift the consciousness of those witnessing it. Allen was a prolific musical force continuing to record and perform up to a few months before his death at the age of 77. Probably the clearest example of this sacred music and the forms that he was to continue using for 40 years is as the Gong trilogy comes to a close with the ” Isle of Everywhere ” on the album ” You “. As a fully paid up member of that generation, Capricorn Research was at the time responding in the obvious way for anyone with the Sun, Moon and Ascendant in that most uncool of all signs, by trying to avoid the reality of things by smoking copious amounts of cannabis. And anyone doing this in 1974 would inevitably have come across Gong, if they hadn’t they just hadn’t smoked enough of the stuff. Zero, the hero of the Gong story missed the third eye ceremony, he was too busy partying, ” taking piece of cake and wine, so now he’ll have to wait another time “. The album concludes with the promise that ” you don’t have to give up hope, you don’t have to give up dope. You just have to be what you are my friend today, its what the Octave Doctors say “. Everytime I listened to it I was assured by the message at the end but also there was the suggestion that I was somehow missing out on something phenomenal. As Allen left Gong and produced his solo albums, particularly Good Morning, Now is the Happiest Time of Your Life and N’ Existe Pas, the presentation of the message seemed to subtly but definitely change. The discovery of Professor Sharpstrings of the Goonhilly Observatory that ” it has to be admitted that the Planet Gong exists, but the question is – do we ? ” By this time Capricorn Research had spotted and responded to the underlying message that you do actually have to give up dope, and follow Neptunian paths of a different order altogether. This and the recognition that if one of the coolest people on the planet openly rejoiced in having the Sun in Capricorn, perhaps it was not such a weight to be endured. 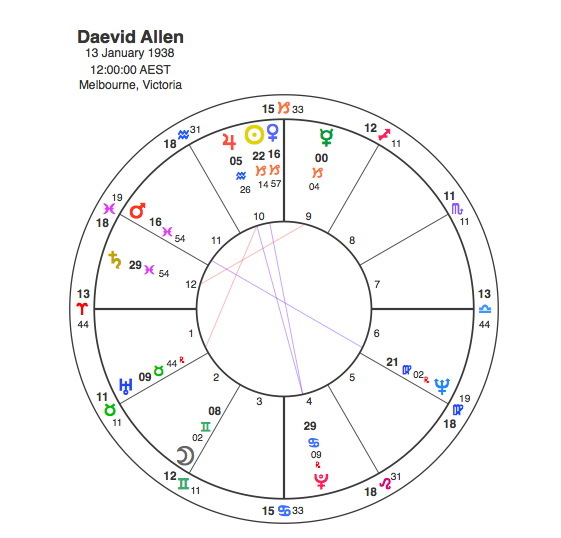 But Daevid Allen was no ordinary Capricorn, the transformative powers of the Sun opposite Pluto would be a testament to that. The Moon in Gemini shows the poet and the instinctive gift of communication. But the mystical message certainly comes from Mars in Pisces opposite Neptune. That he was best placed to convey such a message is shown by his very close trine between his Sun and Neptune. Between 1966 and 68, Pluto was conjunct Allen’s Neptune, trine his Sun and opposite his Mars. Neptune also renewed the natal relationship by sextiling his Sun and trining Mars at the same time. This was the period when he founded Soft Machine and briefly played with them but had his UK visa withdrawn and moved to France to take part in the 68 Revolution but more importantly to form Gong. In 1966 whilst taking acid, he had the transcendental experience that changed his life and gave us the octave doctors, the pot head pixies and all the characters of the planet gong. Daevid Allen had many pseudonyms and aliases, the Divided Alien, Zero the Hero, Dingo Virgin to name but a few. But this writer’s favourite was Captain Capricorn, the character of whom it was revealed ” if nothing’s there to find, you know he’ll find it “. Now that Captain Capricorn has ” gone back where he was born ” this writer has to say thanks Daevid for finding it and giving some of us a few glimpses on the way.